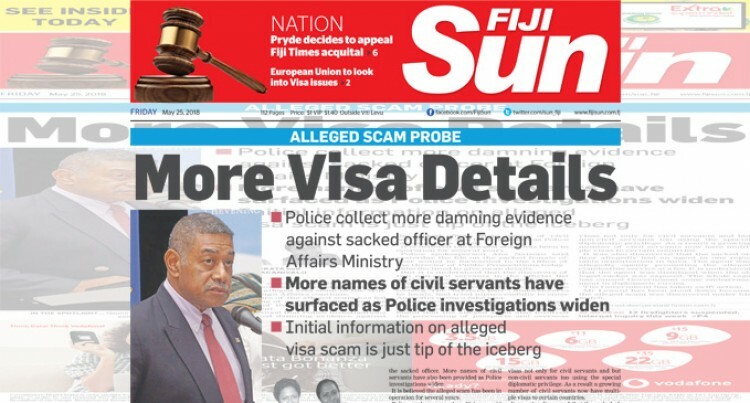 Writer comments on the stories published in the Fiji Sun. The Minister for Foreign Affairs and PM should apply section 128(2) of the Constitution to remove officers because they have breached the role of protocol and consular division. Perhaps the investigation will determine that for legitimacy. A big vinaka vakalevu (thank you) to the Father Peter Ryan Bilo Levu Club – Suva members for hosting their Western brethren in celebrating the 53rd anniversary of the club’s existence. It was a great night of fellowship and sing-a-long with hot stuff kava and delicious food. SA malo (thank you) and once again vinaka vakalevu for your hospitality Suva members. I hope that the chief executive officer of Fiji Roads Authority Jonathan Moore would have time to enlighten me about some works being carried out in Martintar Nadi. Recently, I wrote to Mr Moore on this but he had not replied. I had written to ask why there is a need to put a concrete median with fences, along with the four -lane highway from Mt St Mary’s at Namaka to RB Jet Point at Martintar. Previously there were only zebra markings in the centre and we could turn right anywhere along this stretch, traffic permitting. But now we are restricted, and can only turn left until we come to an opening in the median to do a U-turn. This has caused us to drive into a side street to do this, thus causing a jam at the junction. Surely this extra run of ours has increased our fuel usage, added to our carbon footprint as well as more stress thus adding to NCDs. FRA, why fix things when they are not broken? And why put flowers in the median where you would need to frequently close off one lane to do weeding? Hope you would care to respond to this letter since many of my friends are just as concerned. The Fiji Roads Authority has upgraded the road from Nadi International Airport to the Wailoaloa junction to provide an improved level of service to all highway users. The FRA’s primary consideration is the safety of road users and pedestrians. Following the completion of the initial phase of the work, it was clear that pedestrians were not taking due care when selecting a crossing point in the road. In addition, drivers were using the improved traffic flow conditions to significantly increase their speed. These two issues resulted in an increased risk of accident and injury. The overall risks were exacerbated further by uncontrolled right turns for vehicles. The FRA has taken the decision to implement additional controls to provide clearly defined pedestrian crossing places, to manage traffic speed and to ensure safer traffic movements. These controls include median and side-road fencing, lighting at pedestrian crossings and traffic signals at selected junctions. These works are not yet complete. Once the traffic signals are installed at the remaining junctions, a further audit will be conducted to assess the overall highway operation. Thank you Fiji Roads Authority for removing the road humps at Velovelo. The traffic flow has really improved. I got one more request and I promise if Fiji Roads Authority can do this I will not ask anything from them this year. Can you bring back the traffic lights near Punjas in Lautoka? Please! I am sure a lot of motorists will be happy again. The traffic lights will surely help with the big traffic problem faced by the citizens of Lautoka. Salvation is more than being saved. The same grace that saves, offers us entry into God’s family stays with us to accomplish our sanctification.Through the process of God’s grace being applied to our daily lives, we become more like his son. Grace is never content to leave us where we are – it works to build us up into Christ likeness.